Field Projects is pleased to present SOONEST MENDED, a solo exhibition of work by CARLA EDWARDS curated by Jacob Rhodes. The proverb "least said, soonest mended" implies that a difficult situation will be resolved if there's no more mention of it. Carla Edwards' material interventions question this adage, refusing to assume that injustices will right themselves if ignored. SOONEST MENDED begins with the cast iron sculpture, “Micha'el, Michael, Mīkhā'īl”, a replica of a broken Saint Michael statue left at the site of a public artwork by Edwards in 2016. In this work, the public was invited to leave objects “devotional or otherwise”, over the course of nine months. The statue was offered with wings, sword and shield broken off, unknown as to whether its owner removed these out of distress, spite or despair. The title of this work is an incantation referencing the cross denominational saint’s inclusion in multiple spiritual texts as a protector with the ability to overpower dark forces. The casting process resulted in the saint’s shin detaching from the foot, which held down the wicked, thus rendering the saint incapable of doing good work. Cast in iron, the saint stands fixed. Multiplicity, multiculturalism and polyvalence of meanings are central to Edwards’ work. This is a jumping off point in an attempt to untether how the dominant culture uses symbols such as flags and saints, removing the multiple interpretations of these symbols to reflect and reaffirm only those in power. Edwards manipulates and reconfigures these symbols by making material interventions that alter or deconstruct the original image: the agency of the subject formerly under erasure is asserted through the intervention. “The Blue” represents the latest in an ongoing series of flag works Edwards began in 2008 where she dyed, bleached, cut and restitched American flags into new compositions. “The Blue”, with its soothing sky colors, soft drape and small stature sits in contrast to the vibrating wall sized “Bonfire”, which uses the same technique but with polar opposite effect: the bleached brick reds, crushed oranges, and off-whites tower menacingly over the viewer engulfing them and setting them ablaze. Between the two flag works is “Re-rope,” a term used in reference to mending a broken line for flag raising. 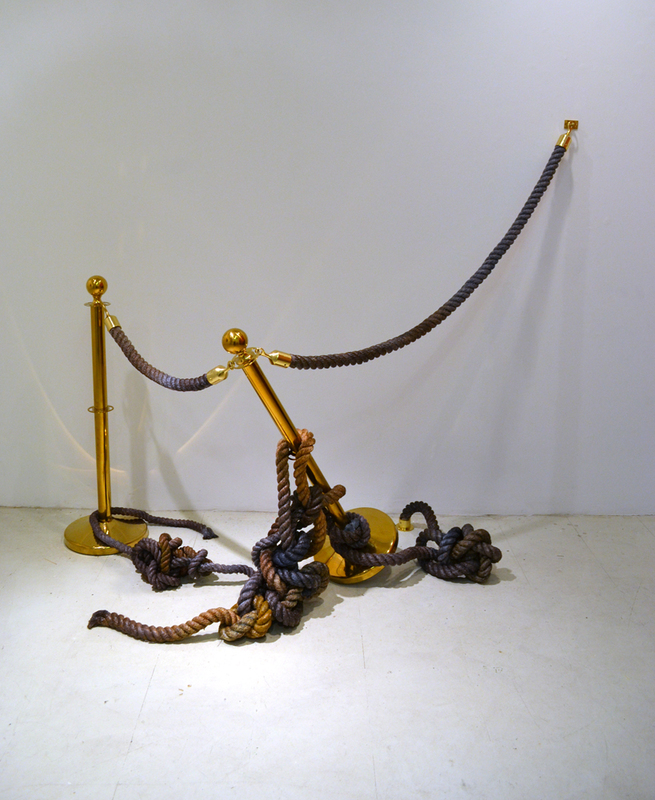 Here Edwards re-appropriates VIP stanchions, adding densely layered pigment, wax, and rope that struggles to overturn its’ own posts. The golden posts appear thin and fragile once they start to tip and the rope barriers become like a virus overtaking, rising and uprooting the host. Carla Edwards is a Brooklyn, New York based artist. She received an MFA from The Rhode Island School of Design and a BFA from The School of The Art Institute of Chicago. She is an alumnus of The Skowhegan School of Painting and Sculpture and was a studio fellow in The Whitney Independent Study Program. She has exhibited nationally and internationally, most notably at the Studio Museum in Harlem, Nuit Blanche in Toronto, Volta5 Basel in Switzerland, and at Socrates Sculpture Park in Queens. Edwards continues to work through the appropriation of pop imagery and Americana vernacular in sculpture, performance, drawing and video.